to view more from this wonderful wedding please view our blog entry here. The beautiful destination wedding of Wendy & Nick who travelled over from the United States to marry at Prague's Vrtba Garden. As Wendy describes it, traveling to Prague to marry was a once in a lifetime experience and having the right photographer who was able to capture their wedding day with both a reportage style as well as a magazine style was very important. It is not enough to simply photograph couples, in fact creating very stylized portraits is far more demanding and appreciated by couple such as Wendy & Nick who opted for a very personalized portrait session at locations of their choice around Prague. 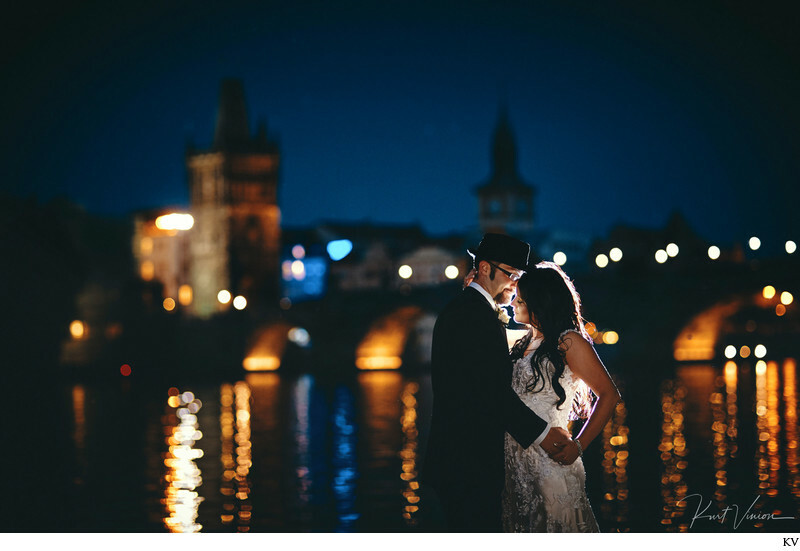 What made their Prague wedding day that much more spectacular was the evening portrait session especially this award winning portrait of them near the Charles Bridge. This image has been featured in many websites and photography related blogs due to its unique character of the rim light capturing the subtle embrace as well as the timing of the twilight hour and the water reflections against the Charles Bridge. Photographed using one off camera speed light for the rim that carried over enough light to light their faces facing the camera. Triggered with a Pocketwizard and one canon flash speed light.